The people from the ILA refused, however, saying that they had come to put an end to squatting on public land. The tent and the other personal belongings and debris that had been left there were cleared away before the ILA staff proceeded on to other tents, where they issued warning letters to their occupants, giving them notice of their impending eviction. In recent summers, an entire tent city has sprouted up on the stretch of coastline between the Habonim nature reserve and Neveh Yam, up the coast to the north. Dozens of tents, sometimes more than 100, have stretched along an expanse of more than a kilometer. In practice, some of the “residents” of these tents assume exclusive control of the area for several weeks. It’s not difficult to understand the attraction of this place, which would certainly be in the running for one of the country’s most beautiful stretches of coastline. It features inlets lined by soft sand and a completely open stretch of land, where there is no construction and where the Carmel Mountains are visible in the distance. The tent city has sprouted up on a stretch of beach where there are no services, including no trash removal, drinking water or toilets. Although the local government in the area, the Hof Hacarmel Regional Council, does periodically clean the area, during the periods in which people spend weeks and even months living there, it becomes an unsightly mess, with mounds of garbage and even toilet paper rolls hanging from nearby bushes. Old couches, remnants of torn tents and other personal items sometimes give the visitor the sense that this is a temporary refugee camp. And then there are the motor vehicles, which are barred by law from the beach, bringing personal belongings to the site. Ultimately the ILA came to the conclusion that it had to act to curb what had become a takeover on a temporary basis of public land by private individuals. 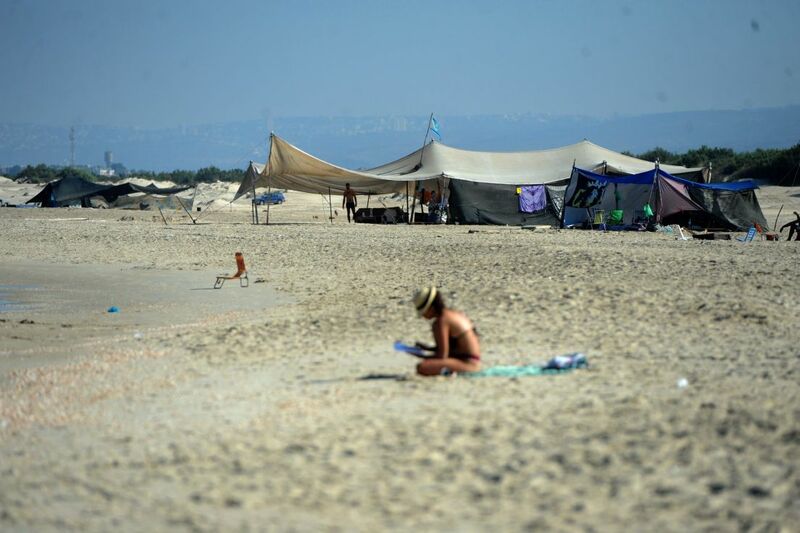 And Eran Livneh, the ILA regional land preservation director, added that there have even been people who have rented out some of the public beach for private events, earning money in the process and barring access to the site to others. The ILA doesn’t have the staff to make daily patrols of the area and generally makes do with weekly visits, during which they serve some of those on the beach with eviction orders. Livneh says his agency can only hope to reduce, not end, the presence of squatters on the beach, saying that some of those on the beach show an awareness that they could be removed at any moment. The presence of long-term beach residents continues, he adds, until the High Holy Days. The staff of the ILA acknowledge the need that people have to enjoy the beach, but they are not prepared to allow the current situation to continue. In the meantime, it will be the upcoming fall weather that will restore peace and quiet to this stretch of beach, but if a way isn’t found to establish overnight facilities that the inhabitants of the beach find attractive, they will be back again on the beach itself next summer.